One-time gifts are single, outright gifts of any amount made to any of 2,400+ funds benefiting the people, places and programs throughout the University of Colorado's four campuses. Find a fund to start your one-time gift! A recurring gift is a fixed amount given on a regular periodic schedule, such as monthly, quarterly or annually. This gift continues in perpetuity until the donor requests to cancel or change it. Payroll deduction is offered to CU faculty and staff as a simple and easy way for you to make a powerful statement about your commitment to CU’s future. 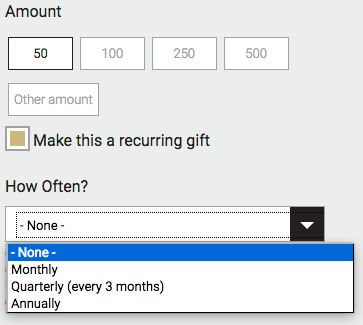 These monthly recurring gifts are automatically deducted from your pay check each month, and can be set up, changed or cancelled at any time. A pledge commitment is a promise by a donor to pay a specified amount in full over a predetermined time period, usually no more than five years. What are Memorial and Honorary Gifts? Memorial and honorary gifts recognize a loved one or someone influential to the donor. Any gift of any amount can be designated as an honorary or memorial donation. More than 15,000 companies and subsidiaries will match tax-deductible charitable contributions made by their employees, retirees and employees' spouses—which can double (or triple) the value of your gift! Matching gifts are directed to the same designation as your original gift, unless your employer dictates otherwise. The CU Foundation will recognize you for the total amount. For questions about this or other aspects of matching gifts, please call 303-541-1290 or email matching.gifts@cufund.org. Outright gifts make up the majority of contributions to CU, and encompass the following gift types: cash, stocks and bonds, real estate, tangible personal property, matching gifts or gifts-in-kind. In general, outright gifts qualify for an immediate income tax deduction. For questions or more detailed information, you can call 303-541-1290 or email gifts@cufund.org. Endowments are gifts that keep on giving, and serve as a reliable long-term funding source that supports a designated purpose or program at CU in perpetuity. The principal amount of an endowed fund is permanently invested by the University of Colorado Foundation in its Long Term Investment Pool (LTIP), generating interest income that is then used to fund the purpose or program designated by the donor. • How does the CU Foundation's endowment work? • Who manages the CU Foundation’s endowment? • Do you charge a fee on gifts or endowments? A planned gift refers to a wide array of customizable giving mechanisms that may blend current and future commitments, maximize tax and estate factors, and optimize your current cash flow or finances. “Gifts-in-kind” encompass donations of goods, rather than cash. Sample in-kind gifts include artwork, furniture, office equipment, medical equipment or certain professional services. A challenge gift is a great way for donors to use their gift as a means of inspiring and encouraging other donors. Typically, a donor will commit to donating some amount of money to a program or cause, with a precondition–or challenge–that all other donors must meet some goal or take some action within a certain amount of time in order for the gift to be fulfilled. Common challenges include goals for total money raised or total number of donors, and "dollar-for-dollar" matches that effectively double or triple the impact of all donations up to a certain amount. Unrestricted gifts are those in which the donor gives CU's leadership total discretion in how the money may be spent, which maximizes their ability to respond to the ever-changing needs of the institution. The easiest way to make an unrestricted gift is to donate to one of CU's many unrestricted funds, often referred to as a "Fund for Excellence," "Annual Fund" or "Dean's Fund." To make a gift over the phone using your credit card, please call the number below and a CU Foundation representative will be happy to accept and process your gift. To make a gift by mail, you will need to download and complete this form, making sure to specify the fund you would like your gift to go to. Then, make out your check(s) for the donation amount payable to the University of Colorado Foundation. The easiest way to make a gift by credit card is to donate online. You may also make a gift over the phone using your credit card by calling 303-541-1290 anytime Monday-Friday from 8am-5pm MT, and a CU Foundation representative will be happy to accept and process your gift. If you received a call from one of our students and pledged to make a gift to one or more funds, you can fulfill your pledge online by finding the fund(s), entering your pledge amount and then checking the box next to "This is a pledge payment." This will help us connect your gift to your pledge commitment. You can also fulfill your pledge commitment, or make changes to it, by calling us at 303-541-1290. Any gift—whether a one-time, recurring or a pledge—can be designated as an honorary or memorial donation. 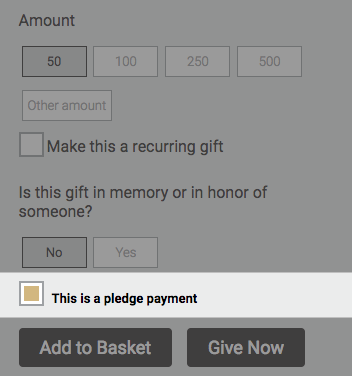 To do so online, find the fund you wish to give to and then select "Yes" under "Is this gift in memory or in honor of someone?" Then, select whether it is "In honor of" or "In memory of" and fill out the requested information. While we only require you to enter Honoree's name, you may also provide us with the additional information and we will reach out and notify the honoree, next of kin or contact of your gift. You may also designate your gift when donating by phone or by mail. A donor may designate a gift to a particular campus, college or school, department or even to a particular fund supporting a specific CU initiative. If you cannot find a suitable fund on our website, can't find the fund you are looking for or just don't know the name of the fund, you can use our Write-In option. Simply go to our "Write-In Fund" page, select the amount you wish to give along with any additional options, and either add it to your Gift Basket or Give Now to complete your gift. When you are ready to complete your gift, use the "Comments" box at the bottom of the final checkout form to provide us with details on how you would like to designate that gift. If we have any questions, we'll contact you to ensure we have it right before process your gift. You may also specify a particular designation for your gift when donating by phone or by mail. For a modest donation, you can support your campus’s Alumni Association and obtain a state of Colorado license plate promoting your pride for CU Anschutz, CU Boulder, CU Denver or UCCS. Contribute to an existing endowment in support of CU by selecting one from our list of endowed funds. Click here to see a list of endowed funds you can give to today, or select "Endowed Funds" from the Fund Type dropdown when searching for funds online. New endowments can be established generally at a minimum level of $25,000, fundable with a gift or commitment payable over up to five years. Certain CU campuses and programmatic categories may have different endowment minimums. If you are interested in creating a new endowment or have questions about endowment minimums, please contact us at giftadministration@cu.edu or 303-541-1252 and we will connect you with a development professional in the academic unit you aim to support. Click here to see our Guide to Endowments and learn more about the specifics of CU's endowment. Contact CU Foundation Accounting at accounting@cufund.org or 303-813-7935. While such assets are typically liquidated before being distributed (as cash) to campus or invested in endowments, we can help you determine the appropriate process. You should consult your advisors for tax and legal advice. Click here for Instructions for Electronic Transfer of Marketable Securities. Contact our Gift Planning and Leadership Team for guidance on these individual circumstances. Note that in-kind gifts of personal property are processed by the university. Learn more at our Gift Planning and Leadership Giving website. For assistance with making a gift online, please email giving@cu.edu or call 303-541-1258. For all other gift-related inquiries, call 303-541-1290 or email gifts@cufund.org or visit our Contact Us page to find the best contact to address your needs. If CU is a public university, why are private gifts needed? The state of Colorado provides less than 6 percent of the university’s $3.5 billion operating budget, down from more than 25 percent in 1990. Private support—which, in 2015, comprised a larger share of CU’s budget than funding received from the state of Colorado—is an important and increasingly fundamental component of CU’s budget. And targeted donor support for strategic priorities allows the university to attract and retain the best and brightest faculty, provide scholarships, build first-class facilities and direct education and research toward filling community needs and solving societal problems. The CU Foundation is a 501(c)(3) charitable organization. All gifts to the Foundation are tax-deductible to the fullest extent of the law, but circumstances vary depending on each donor’s individual financial situation. You should consult with your tax attorney/advisor concerning the deductibility of your gift. What is the CU Foundation’s tax ID number? Yes. Gift tax receipts are typically issued within 2 business days, and can be delivered via email or mail. How quickly will my gift be processed? We aim to process all donations and issue gift tax receipts within 2 business days of when they are made. How can I be sure gifts go to their intended purpose? Gift funds and gift agreements are contractual documents, and our policies and practices are oriented toward ensuring that the donor’s intent is honored. CU Advancement staff work closely with faculty partners to maximize the impact of donor support on CU programs. Donors who establish endowments receive periodic Endowment Status Reports that update these donors on investment performance and fund balances. We provide an Annual Report and other communications in an effort to be transparent to donors and the community. An endowment typically needs to be funded at a minimum level of at least $25,000 (though minimums may vary by campus or programmatic category) in order to actively support the specified CU program. Once that occurs, the endowment distributes 4% of its average fair market value each year to the specified CU program. Click here to learn more about the specifics of CU's endowment.